Last year I read and loved The Boarding-House by William Trevor, a wickedly funny tragi-comedy of the highest order, first published in 1965. Ten months on, I’m returning to this writer for another of his early novels, The Old Boys, which came out the previous year in 1964. Like its successor, The Old Boys is a sharply observed ensemble piece featuring a cast of rather idiosyncratic characters – this time, the members of an Old Boys Association for an English public school. In short, the novel explores the longstanding beliefs and rivalries that resurface amongst the men (all in their seventies) when the committee comes to elect a new President. It is a marvellous novel, shot through with a particularly savage streak of humour and some poignancy too. Needless to say, I enjoyed it hugely. The novel centres on Mr Jaraby, who is eager for the role of President of the Association. On the whole, life for Jaraby has been shaped by his days in the public school system, an environment where bullying and intimidation of the younger, weaker individuals were part and parcel of life. Inspired by Mr Dowse, his mentor and Housemaster, Jaraby spent much of his time at school persecuting his fag, a somewhat awkward young boy named Nox – an experience that Nox, another Old Boy, still remembers to this day. In spite of the passing of time, Nox remains deeply resentful of his treatment by Jaraby, a point that fuels his determination to block Jaraby’s succession to the presidency, even if this results in the election of a less competent man. In short, Nox wishes to discredit Jaraby (there is some suggestion that the latter frequents brothels), so he hires a private detective, the appropriately names Swingler, to gather evidence of an incriminating nature. This all gives rise to some very amusing scenes, particularly when Nox decides to force the issue by tempting Jaraby with a little bait. Much to his annoyance, Jaraby finds himself being stalked by a strange, presumptuous woman who insists on joining him for tea and cakes (‘Shall we gorge ourselves on meringues today?’), all played out through Trevor’s pitch-perfect prose. The punctilious Jaraby is also experiencing difficulties at home, particularly in relation to his wife, the rather forthright Mrs J. The Jarabys bicker and snipe at each other on a constant basis, mostly over their forty-year-old son, Basil, another former pupil at the school, who has turned out to be a great disappointment to his father. Mrs Jaraby, on the other hand, would like Basil, a rather dubious bird fancier, to come and live at their house, a point she continues to press with her husband at every opportunity. While Basil has already had a few brushes with the law, Mrs J believes the worst is behind him, and she hopes to welcome her son back into the fold. Mr Jaraby, however, is having none of it, believing his wife to be of unsound mind and in need of psychiatric care. Perversely, it is Mr Jaraby, with his petty prejudices and obsessions, who would probably benefit the most from specialist attention, although both of the Jarabys have their flaws and failings. Alongside the themes of power, revenge and the resentments we hold on to in life, the novel also explores the nature of ageing, mainly through the portraits of other Old Boys on the Committee. There are touches of humour and poignancy here, a sprinkling of dark comedy alongside the tragedy and sadness. The poignancy comes through in the portrait of Mr Turtle, a gentle, lonely Old Boy who is finding it difficult to remember things, particularly in the short-term. In some ways, Mr Turtle would prefer to return to the simplicity of his schooldays, complete with its regular routines and rituals – a point that becomes apparent during the annual school visit for Old Boys’ Day. As the narrative plays out, there are one or two shocks for the main players, the Jarabys in particular; but I had better not say any more for fear of revealing spoilers. 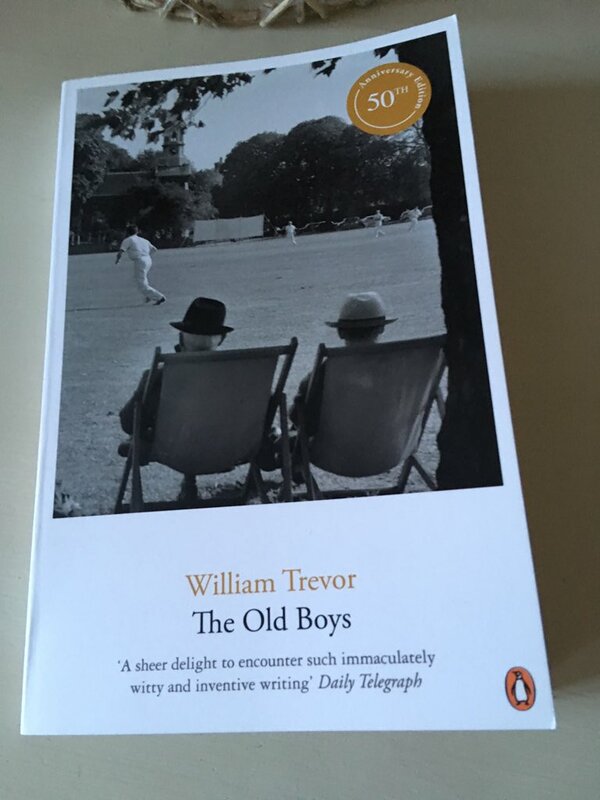 The Old Boys is another excellent novel by William Trevor, sharing many similarities with The Boarding-House. Much of the book is written in dialogue, which gives the story a sense of immediacy, almost as if you are watching a play unfold before your eyes. Although only touched on through memories, the realities of the public school environment are very well portrayed, complete with all their cruelties and insensitivities. It is a world where influence and power over others are all important, dictating the nature of life for the younger, less experienced boys. The only glimmer of hope for these individuals is to wait until they too gain senior status and all the authority this confers. It is clear that Nox was never able to acquire this kind of standing within the school, a point that has left him marked by Jaraby’s sadistic behaviour for most of his adult life. As a novel, The Old Boys highlights the importance of our formative years, how the things we experience during this time continue to shape our lives well into adulthood. It can be hard to forget the injustices of our childhood, especially if they are never adequately redressed at the time. Trevor explores this theme through the novel with its striking blend of sharpness, dark humour and tragedy. This is my contribution to Cathy and Niall’s Reading Ireland event which started yesterday. You can find out more about it here. For another take on this novel, please see Kim’s review here. The Old Boys is published by Penguin Books; personal copy. This entry was posted in Book Reviews, Trevor William and tagged #ReadingIreland, Book Review, Fiction, Ireland, Penguin Books, William Trevor on February 26, 2019 by JacquiWine. Lovely review, Jacqui. I must go back and read Trevor’s earlier work. I’m really enjoying these early novels, darkly comic stories with touches of poignancy – they’re well worth exploring. I’ll see what we have on our shelves. His later writing is much more melancholy. Yes, I’d like to read some of his later work, maybe the final stories when they come out in paperback. Thanks, Cathy. I’m glad the timings worked out for me this year! I get the feeling that these early novels are somewhat different in tone to his later work, much darker and savagely comic in style. I’d love to hear what you think of them. They sound right up my street Jacqui! I’ve just read his collection of stories After Rain and they seem darker than the later novels too. Oh, I’ll be interested to see what you have to say about that. I’ve read one or two of his stories in journals and anthologies, but it would be nice to do a dedicated collection at some point, maybe later this year if I get a chance. I haven’t read Felicia’s Journey, but I do recall the film with Bob Hoskins. It must be about 20 years old by now! I tend to like books about people who have known each other for a long time and havevold ghosts haunting them. The book also sounds like it is funny which is a plus. Trevor sounds like a very worthwhile writer. It’s a great subject for fiction – long-held resentments and prejudices festering away, just waiting to come out into the open. Some of the humour is quite savage here, definitely at the darker end of the spectrum if you see what I mean. Thanks, Karen. I think you’d like The Boarding-House, the one I wrote about last year. It’s not a million miles away from the worlds of Patrick Hamilton and Julian MacLaren-Ross, complete with all their idiosyncrasies and misfit characters. I LOVE WILLIAM TREVOR BUT CANNOT GET HIS BOOKS ON KOBO FOR RREE OR FIND HIM IN ANY LIBRARY..SO SAD…. Oh, that’s a shame. Well, I hope you get a chance to read more of him soon. He was a wonderful writer. Have you tried buying second hand? Abe Books and Alibris have very cheap second hand remaindered books and if you live in US or UK postage is also cheap. I often find gems there, but then I have to pay for postage to Australia. Love William Trevor’s acerbic wit. Thanks, Gert. Have you read this one? A long time ago. I don’t know why I have forgotten about him. The Story of Lucy Gault sounds intriguing and it was short listed for the Booker, as does Cheating at Canasta. Lucy Gault has been recommended to me in the past. It does sound excellent but very sad. I’d like to read some of his short stories in the future – but there are so many of them, I’m not sure where to start! Other Gert has just discovered the short stories Cheating at Canasta on her shelves, so may be able to steer you in the right direction. Oh, excellent. I’ll be very interested to hear what she thinks! The title alone is very appealing. Oh, great! I really hope you like it. His short stories sound excellent, beautifully observed and judged. I quite fancy reading his final collection, maybe later this year once it’s available in paperback. I really like the sound of this one, the last William Trevor I read was Mrs Eckdorf… Which I wasn’t mad about, but I generally really like his writing, such a good sense of place and excellent characterisation. I think most of the books I have read by him are from later in his career, it’s always so interesting to see where a writer started. I think you’d enjoy this, Ali. The characters are nicely captured, complete with their inherent flaws and failings. There are some pretty unlikeable individuals here, but they always feel credible and believable – and, as you say, the writing is excellent. It’s a good one if you’re looking for something dark and spiky. Sounds really good. I read my first William Trevor book last May. The Story of Lucy Gault, it was sad but so beautifully written. I’ve picked up a couple more of his books with this month in mind. Lovely review. Oh, I’d really like to read that at some point. It seems to be a favourite amongst fans of his work. I’m glad you liked it so much, in spite of the sadness. I CANNOT FIND WILLIAM TREVOR ANYWHERE,UNFORTUNATELY. I’ve never read William Trevor but your review has completely whetted my appetite – it sounds marvellous! I’ve just got a secondhand copy on Abe Books for £2.90 all told. I look forward to reading it. Thanks Jacqui. You’re very welcome! I do hope you enjoy it. Trevor is a terrific writer with a real insight into human nature. A little like Elizabeth Taylor, he has a rare ability to capture individuals in their most private of moments. I couldn’t help but feel for Mr Turtle as he struggles to cope with his failing memory – the scenes in which he appears are particularly poignant. It’s sounds very good but different from the William Trevor I know who is particularly good at depicting women. Admittedly, I’ve only read a few novellas, one novel (The story of Lucy Gault) and short stories. You’re review reminds me that i want to read more of him and also how much I used to enjoy joining in the Reading Ireland Month. I get the feeling his early novels were somewhat different from the later ones, more savagely comic and devilish in certain respects. Nevertheless, there are real moments of poignancy in this one, particularly in the depiction of Mr Turtle. I’d like to read some of his other, more melancholy books, maybe Lucy Gault or Love and Summer as always seem to attract such positive reviews. Of course, it’s an early book. I forgot about that. I guess he mellowed a bit. But in a good way. Yes, it’s interesting how some writers mellow with age while others — Patrick Hamilton springs to mind here — become more cynical and bitter. True. I’ve still to read Patrick Hamilton. I guess his outlook on life wasn’t exactly positive to begin with. That’s probably a fair reflection! Interestingly, after I’d posted this piece, someone replied to me on Twitter to say that it had been adapted for the stage with Sir Michael Redgrave in one of the lead roles, possibly Mr Jaraby. Quite a production, I suspect! That sounds great! I wonder if it was filmed at all? I may go on a hunt! Let me know if you find anything. I’d be very interested to see it! I’ve just finished reading The Old Boys on your recommendation and have thoroughly enjoyed it thank you. The jacket of my old copy quotes Evelyn Waugh who called it “uncommonly well written, gruesome, funny and original” which it is. It’s also a novel you felt that Waugh could have written – the dark humour is very much him. What struck me is how the school, in trying to equip boys for life and make them achievers, has succeeded only in breeding generations of dysfunctional men. Few of them appear to have married and those who have are not happy. Having been brutally treated during their formative years they have failed, seemingly, to have done much in life and the school retains a hold on them. Dowse, the legendary housemaster worshipped by Jaraby, was “perverted, sadistic, malicious and dangerous” according to General Sancutary and, in turn he affected Jaraby amongst many other including his son Basil, also an old boy and now a grievous criminal. It says much that Mr Turtle pines for lying in the sanctuary of the dormitory in a cold bed feeling homesick. But it is wonderfully funny and I’m still laughing at Mrs Jaraby telling her husband that the despised cat Monmouth, who she has dispatched, was run over by a van and looked like a tiger rug on the road. I shall look up The Boarding-House. Oh, I’m so glad you enjoyed it, Philip – that’s really wonderful to hear! Yes, there’s definitely a touch of Waugh about the humour at times – it’s savagely wicked. Nevertheless, Trevor manages to counterbalance that devilish streak with some nicely judged moments of pathos, a touch that ensures the overall story doesn’t feel too vicious. I think your comments about the school are spot on as it fails virtually all the Old Boys, albeit in different ways. The details of public school life feel very authentic – also reminiscent of Waugh, especially the first part of his debut novel, Decline and Fall.